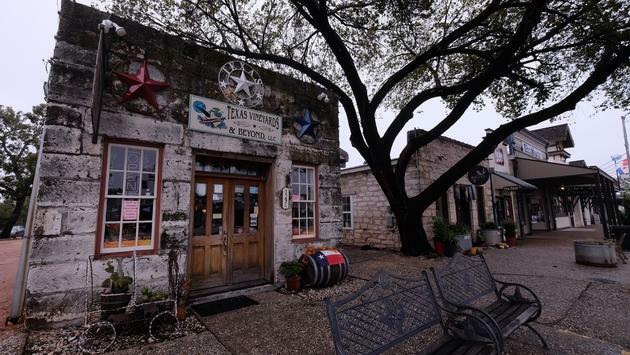 Main Street in Fredericksburg is filled with lovely stone buildings, with lots of fun shops and wine-tasting rooms. FREDERICKSBURG, TEXAS - I stroll into what I think is a home décor shop or antique store on Main Street and find a luscious bar with deep dark wood, craft cocktails and a cool courtyard out back. A few minutes later I’m touring the National Museum of the Pacific War and find a striking exhibit on the art of Hawaiian shirts. Later in the day I find myself hunkered inside the famous Luckenbach bar a few miles outside of town, where I find a dancing rooster boogeying to a country tune and a “Himalayan opossum” inside a glass case. I’m not quite sure what I expected when I drove up to this town from Austin on a recent October day, but it probably wasn’t this. If you’re looking for a surprising corner of Texas, you definitely have come to the right place. As I’m heading out, I spot a temporary exhibit called “The Art of the Aloha Shirt.” Not exactly what one expects in the land of cowboy boots and Lyndon Baines Johnson, the former U.S. president whose ranch is just a few miles south of town. Fredericksburg is a hugely popular wine destination, with something like 45 wineries in Gillespie County. At Lost Draw Winery, worker Chris Herrera tells me owner Andy Timmons was a fifth-generation cotton and peanut farmer before moving into the wine business. The winery is a small but growing affair in a downtown Fredericksburg location that was a gas and oil distribution center only a few years ago. Most of the grapes come from up around Lubbock, several hours north of Fredericksburg, where nights are cooler and where the loamy soil is better suited for growing grapes. The Viognier is soft and fruit-forward, while the Zinfandel is a lush, full red. Becker Vineyards is south of town a few miles, on a glorious piece of land with old stone buildings, a towering windmill and a massive patio. Worker Bobby Totten tells me they get about 20 per cent of their grapes from the Fredericksburg Region and the rest from Lubbock. Totten also says Becker wines have been served at the White House and poured often for visiting royalty, including the King and Queen of Spain. They’re famous for their Viognier, which I quite enjoy. They also make nice red blends. Just a few minutes outside Fredericksburg is a former trading post that became a country music legend. Luckenbach was built sometime in the 1880’s and was the centre of a community of several hundred folks before it fell on hard times. The story goes that a newspaper ad in 1970 contained the following: “Town – population 3 – for sale.” A fellow named Hondo Crouch (of course), a rancher, bought the ranch for $30,000 along with Kathy Morgan and an actor named, wait for it, Guich Koock. Three years later one of those magical events happened that transforms the ordinary into something special. Country star Jerry Jeff Walker and his band plugged their instruments into the electrical sockets of the dance hall and recorded a live album called Viva Terlingua, which became a classic. The legend grew, so much so that none other than Willie Nelson and Waylon Jennings wrote the number one song “Luckenbach, Texas” in 1977. Willie held some of his Fourth of July picnics at Luckenbach in the late 1990s. Today it’s as much of a shrine to country music fans as Liverpool is to admirers of The Beatles. Whittington, who likes to say he’s employed at Luckenbach but doesn’t actually, you know, work there, loves to have fun with customers who roll through the old post office building, which is also a general store and, in the back, a tiny packed bar that’s covered with country and western bric-a-brac; old photos of Waylon and Willie, weathered concert posters and even a police badge from Peterborough, Ontario. Most days there’s a pickers’ circle out beneath a giant live oak tree, with musicians from all over huddling together to make music off the cuff. The day I’m in “town” it’s uncharacteristically cool, so folks are huddled in the back bar around a wood stove. A young man named Brent Ryan is playing a guitar soft and gentle. Later, an old-timer who plays a mean and oh-so-soulful harmonica joins in for a brief jam session. At this stage, Rusty the Rooster – apparently not happy with the weather outside – comes in and struts his way across the floor, his steps keeping time to the music. Well, kind of. Over at the bar I chat with a woman of a certain age with a cowboy hat festooned with dozens of silver beer tabs and eight rings; one on each finger on both hands. There’s no shortage of turquoise on these hands. Whittington says the casual jam sessions at Luckenbach are a truck load of fun. Later in the visit, Whittington shows me a little of the general store, including a stuffed critter in a glass case. “That’s a Himalayan Possum,” he tells me. I raise an eyebrow, waiting for the punch line I know is coming. Whittington shows me the dance hall, where Jerry Jeff Walker and his band played. It’s a thing of casual beauty. I only I was here on a warm Saturday night with some friends, a good band with a fiddle or two and a metal tub full of Lone Stars. Vaudeville Bistro is a fine spot to dine in Fredericksburg, with a restaurant in the basement, a lovely home décor shop on the main floor and an art gallery up above. Try the power bowl at lunch, with avocado, veggies and rice. Great coffee, too. Otto’s is a lively German bistro filled with locals. Try the flammkuchen (German flatbread) and the duck schnitzel with braised cabbage. They also make excellent craft cocktails. Fredericksburg Inn and Suites is a short walk from Main Street and has nice rooms, two pools, a hot tub and an outside, wood-burning fireplace. Breakfast is included. Das Peach Haus is a legendary food shop and market in town that sells a huge array of tasty-looking jams, jellies, pasta sauces, peach cobbler and other treats. They also have a winery and a culinary school. There’s a pretty pond out back with nice benches if you want to sit a spell. Austin is a little more than an hour by car; San Antonio a bit closer. The LBJ ranch is only a few minutes from Fredericksburg.